After the delightful celebration dinner on Thursday evening, Patricia and I attempted to “sleep in”, but 7 am was the best we could do. 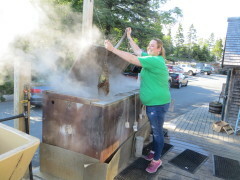 It was nice to take our leisure with getting ready for breakfast, and not to worry about packing our suitcases and taking them to the trailer. 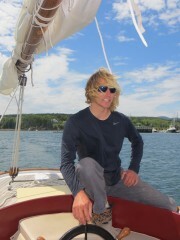 The van and trailer were leaving at 9 am to take riders to the Bar Harbor and Bangor airports for flights back home. Just as all the bags were loaded and the passengers saying their last goodbyes, Michelle discovered that the battery was dead. 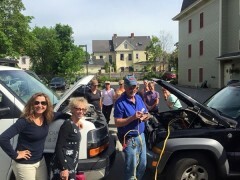 Luckily the maintenance man for the hotel had jumper cables and was able to give the van a quick charge, so that departure was not greatly delayed. 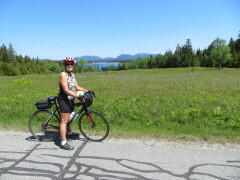 With help from Janet, Susan G.’s friend from New Brunswick, I moved my suitcases to the Shore Path Cottage, and even took my bike to the Bar Harbor Bicycle Shop, as I discovered that my handlebars had been twisted the previous day. 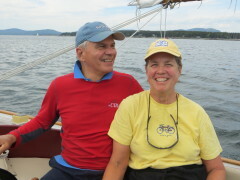 I had been looking for a sailboat cruise for Don and me, and discovered that Patricia and her friends Joe and Priscilla were booked later in the afternoon. 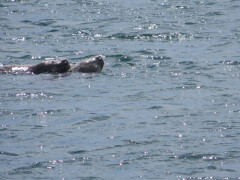 We invited ourselves to join them, without protest. 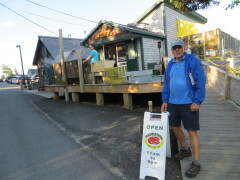 Don arrived after his 1,330 mile drive from Indianapolis around 11 am, settled into the B & B and we quickly found some lunch before heading to Southwest Harbor for our sailboat cruise. 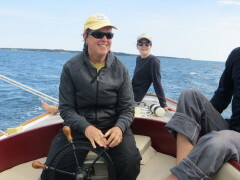 We boarded the Alice E., a former lobster boat, with Alex as Captain and Christy as Mate for 3 wonderful hours in the harbor. Thankful to the maintenance man with jumper cables to get the van moving. Our wonderful B & B home for 3 nights. 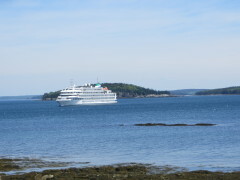 Cruise ship docked off shore, visible from Shore Path Cottage. 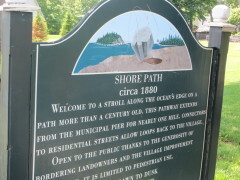 There is a private path from the B & B to the Shore Path along the harbor. 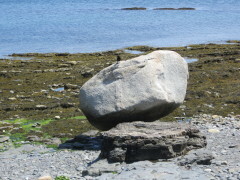 This Balance Rock, a geological phenomenon, is along the Shore Path. 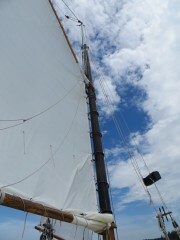 We are enjoying our afternoon sail. 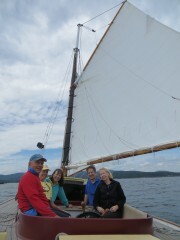 From right: Priscilla, Joe, Patricia, me, Don – a great crew! 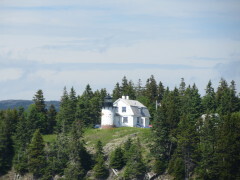 Lighthouse directs boaters into the harbor. 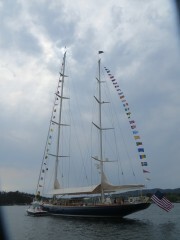 Large sailboat Rebecca in the harbor – crew of 5-7. 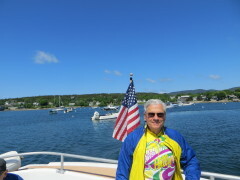 Still enjoying the cruise, as it got a bit cooler. 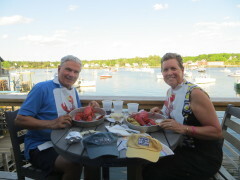 Dinner after our sailboat cruise. 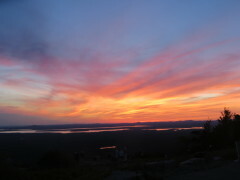 After dinner, Don and I drove up Cadillac Mountain, but the clouds had come in and we could not enjoy the sunset. 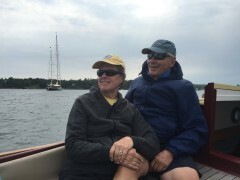 On Saturday, we decided to take our bikes and ride the Cranberry Island ferry to explore these islands in Southwest Harbor. 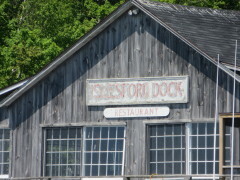 The season has not officially begun, so we discovered that there were no facilities open on Little Cranberry Island. 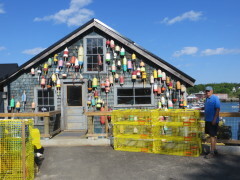 We disembarked on Great Cranberry Island, taking our bikes to explore on the 4 miles of paved road and another 4 other miles of dirt road to several inlets, then enjoyed lunch at the local cafe. 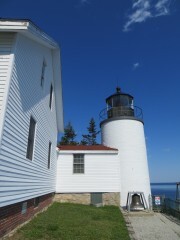 After the ferry returned us to Southwest Harbor, we continued around the peninsula and visited the Bass Harbor Lighthouse. 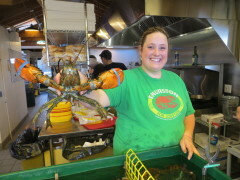 Continuing further around the peninsula, we ended up in Bernard/Tremont and discovered Thurston’s Lobster Pound. 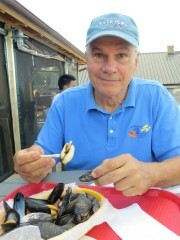 It was a bit early for dinner, so we enjoyed steamed mussels as a appetizer before ordering our lobsters, my first whole one of the summer. 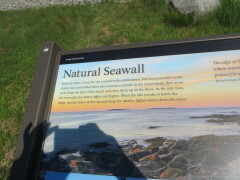 We continued our drive around Somes Sound to Northeast Harbor and visited Thunder Hole – no thunder in the waves, but a beautiful wave view. 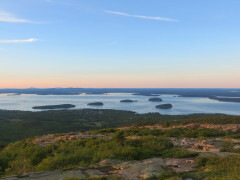 We managed to miss sunset on Cadillac Mountain (poor navigation on my part), but enjoyed twilight overlooking the harbor in downtown Bar Harbor. 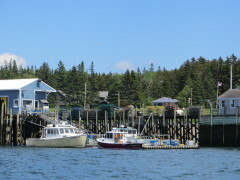 The Cranberry Island ferry, pedestrians and bikes only. 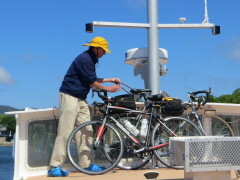 Our bikes were roped on deck. Don on board the ferry. 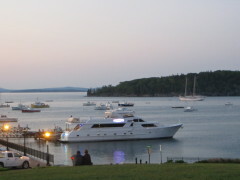 Bay view on Cranberry Island. 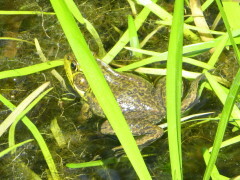 We passed a pond with lots of frog sounds, and finally saw one of the croakers. 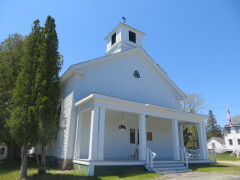 Unitarian Church on Great Cranberry Island. 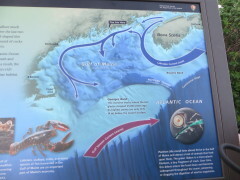 Map of Great Cranberry Island – we learned lots about the island’s redevelopment. 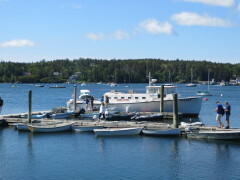 Harbor at Little Cranberry Island. 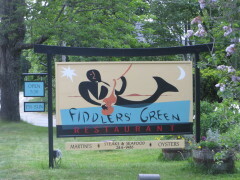 The restaurant on Little Cranberry wasn’t open yet. 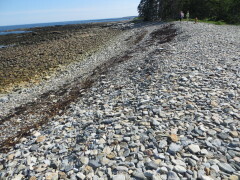 Not much sand in Maine, more natural seawall. 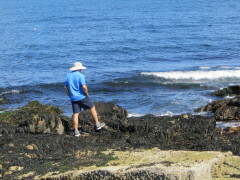 You don’t walk barefoot on these beaches. 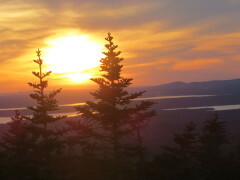 On Sunday, we decided to go for a bike ride in Acadia National Park. 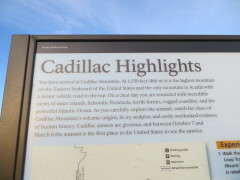 First, we discovered that Don had a broken spoke on his bike, then we were told that skinny tires didn’t work on the carriage paths, and riding on the main road was hazardous, with no shoulder. We opted to rent mountain/comfort bikes and headed to the park to ride the carriage paths. 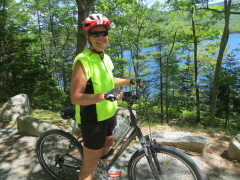 We wandered passed Eagle Lake to Jordan Pond, where we enjoyed lunch and the traditional popovers. Later in the afternoon, we met up with Bill Phillips (from my Oxy years) and his ski friends Chris, Jen, Annie, and Richard. 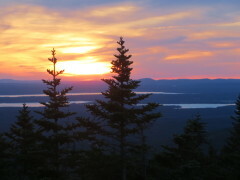 Ultimately, we all drove up to Cadillac Mountain and enjoyed a beautiful sunset, then ate late dinner back in Bar Harbor. 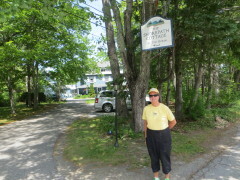 On my comfort bike along the carriage paths. 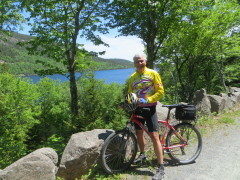 Don on his mountain bike above Jordan Pond. One of 17 stone bridges in the park. 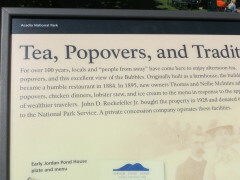 The carriage paths were laid out by John D. Rockefeller. 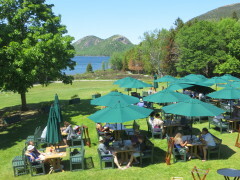 Outdoor dining facilities at Jordan Pond. 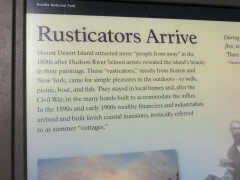 Artists came to Acadia for the nature settings. 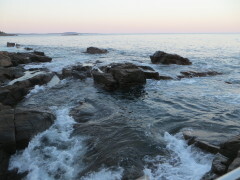 About 10 minutes before sunset. Just as the sun is setting. 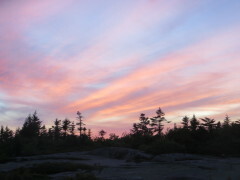 At least 15 minutes after sunset, the sky is still radiant. 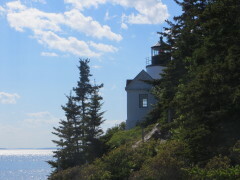 The weather had been perfect, the accommodations wonderful – Don and I vowed to return to Maine and explore further another time. Oh My!!!!!!!! That’s all I can say. WOW! What a perfect ending to a perfect ride for a perfect couple. No better way to end a beautiful trip by a great determined rider, and a wonderful spouse. Our compliments to you both. 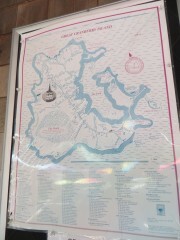 The tourist bureau should pay you Dolly ! 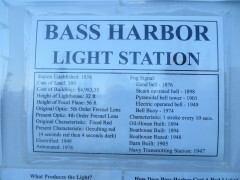 The pictures and descriptions are wonderful.